It is good to know that during the winter, there are low-temperature limits when your builder won’t be able to pour concrete. Though this won’t affect the quality or strength of your home, it might mean that you have to wait until conditions are right to get the foundation poured and cured. We’ve seen a few below zero temps already this year, which aren’t conducive for pouring concrete. Again, this is a minor setback, and with a quality custom builder who’s knowledgeable about the building process as well as the Michigan weather, you should be able to find an ideal date to dig out the foundation and pour concrete. Perhaps one of the most important considerations to make when building your custom home in the winter, is your schedule. Though your builder will do his or her best to pick a few warmer, less snowy days for the start of the project, there’s really no predicting winter weather in West Michigan. You’ll need to enter into the project with a slightly flexible conception of the completion date. So long as you’ve chosen a quality builder, your home will be completed as close to the originally set date as possible, but expect there to be one or two weather delays over the course of the project. Though it might take a little bit longer to get the foundation poured and the exterior of your home put in place, once your builder has the home sealed off, you’ll be in the clear. Weather won’t affect the progress of your winter custom home all that much once it’s dried in. Know that after you get those first initial steps of the building process completed, you’ll be in the clear, and your home should move along as close to your original schedule as possible. In the end, if you’re planning on building your custom home in the winter, the best thing to do is have a face-to-face conversation with your builder. Ask them what setbacks to expect during winter construction, and request that they keep your fully informed about your project at all times. If you’re working with a quality custom home builder, communication shouldn’t be a problem, but if you’re at all concerned about the timeline or the completion date of your home, it never hurts to ask. One often overlooked benefit of building in the winter, is that in most cases, you’ll be able to move in during the spring, just as things are warming up. This gives you the ideal opportunity to get a jump on landscaping as it’s the perfect time to plant, and most landscaping crews don’t start to get really busy until early to mid-summer. You’ll be able to start off the new year in your new custom home and landscape it exactly to your taste. It’s good to know that you can build your new custom home in the winter. Though it might not be the right choice for every homeowner, building in the winter does have its benefits, and it’s nice to know you do have that possibility. 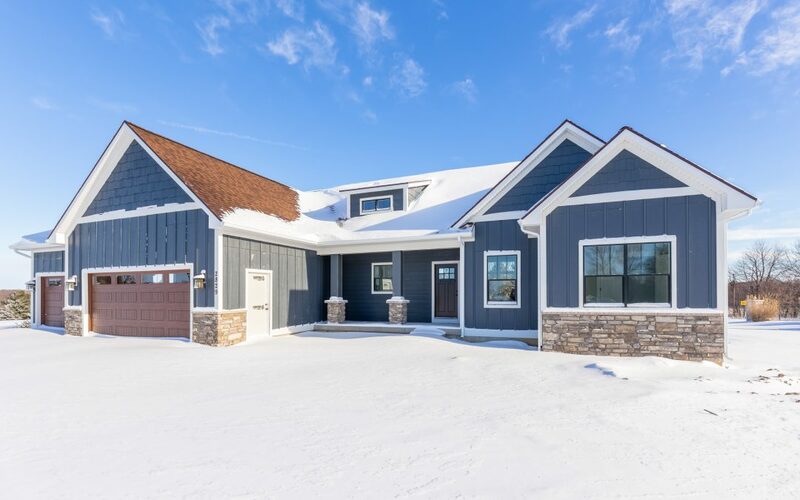 If you’ve been considering building a new custom home, but have been putting it off because of winter worries, why not give the experts at Whitmore Custom Homes a call? We’d be happy to answer any questions and address any concerns you have about building in the winter. To see some of our previous custom projects, or to get more information about our building process, give our office a call at 616-681-4077 or visit our website today!